Al Jazeera is not letting their moment in the (positive) U.S. spotlight go to waste. They have taken out a full page ad in today’s New York Times highlighting all the positive reviews they’ve been getting this week (including a quote from us). 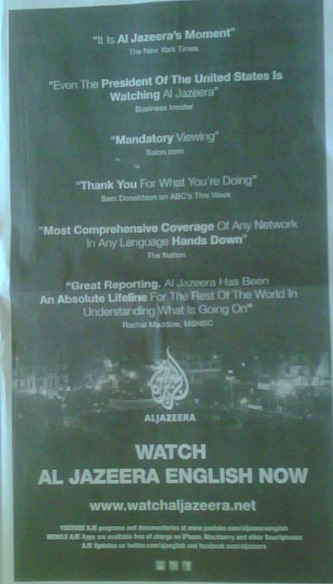 At the bottom of the page they’ve included a link to where Al Jazeera can be found online in America. Admittedly not terribly useful in a print ad, but it certainly goes some ways to pointing out they are not carried on cable here, which is presumably the point of the ad.